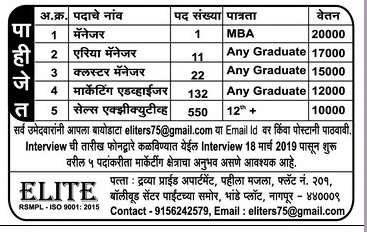 Elite Nagpur (Elite Maharashtra), Nagpur published a new job notification for Manager, Area Manager, Cluster Manager, Marketing Executive & Sales Executive Posts. The recruitment is for total 716 Vacancies. The willing candidates are informed to see the latest notification March 2019. Qualification required MBA/Graduate/12th Pass and More. Last Date of offline application is 18-03-2019. For More details of Elite Nagpur Recruitment 2019 Read Below. Education Qualification: MBA/Graduate/12th Pass and More. For Post wise Education Details follow the detailed advertisement. Interested & Eligible candidates can send their application along with all the necessary documents and testimonials Email to eliters75@gmail.com. Then attend for interview addressed at mentioned bellow in official advertisement. महा आईटी मध्ये 4861 जागांसाठी मेगा भरती २०१९ (Last Date of online application is 29-03-2019) (Education Qualification: 8th Pass to Graduate).